The 19th National Congress of the Chinese Communist Party (CCP) opened on October 18 at the Great Hall of the People in Beijing. While most China observers are still chewing on Chinese President Xi Jinping’s three-and-a-half-hour-long work report, some of the more routine aspects of the first day also sent a message worth noting — particularly to China’s media. 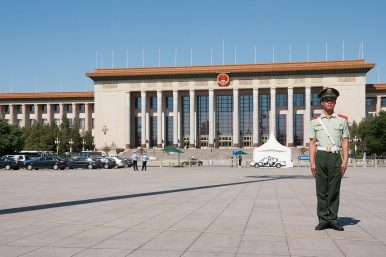 As The Diplomat reported earlier, all of Beijing was at the highest security level ahead of the 19th Party Congress. In spite of that, the security guards for the conference are still taking no chances, even toward those who are allowed to attend the meeting. According to Hong Kong newspaper Ming Pao, since the afternoon of October 16, no common people have been allowed to enter the area close to Tiananmen Square, where the Great Hall of the People located. As for journalists who are to report on the meeting, they have to go through seven security checks before finally entering the conference room, repeatedly presenting their journalist ID cards, invitation letter, and their belongings for scrutiny by police and security. Once journalists made it through the strict series of checks, they were greeted by a familiar — and perhaps unwelcome — face. On October 17, CCP held a press conference before the opening of the 19th Party Congress. It was hosted by Tuo Zhen, the spokesperson of the 19th Party Congress. Other than his current, temporary position, Tuo has been serving as the deputy head of the CCP’s Propaganda Department since late 2015. Yet, for those familiar with China’s media and censorship, Tuo is actually more well known for his part in the Southern Weekly incident in 2013. In January 2013, when Tuo served as the head of the CCP’s Propaganda Department in Guangdong province, it was reported that Tuo forced Southern Weekly, one of the most liberal newspapers in China at the time, to add a commentary that glorified the CCP. The incident then triggered a wave of protests and criticism among Chinese journalists as well as Southern Weekly’s readers across the country. Many people called for Tuo’s resignation. However, the end result was the opposite: Southern Weekly ended up having its editorial staff reshuffled and Tuo himself was promoted from Guangdong province to the capital in 2015. As the CCP has been tightening censorship in China, Tuo’s reappearance on the center stage seems to forecast the CCP’s moves after the 19th Congress. In fact, in his speech on October 18, Xi did point out that the CCP should “firmly grip the leadership in the field of ideology,” including media. He said that the CCP will improve the influence, credibility, and communication skills of Chinese media. “[We will] put forward a responsibility system in the field of ideology, enhance the management … and take a clear-cut stand in resisting all kinds of wrong views,” Xi added. Particularly regarding the internet, he mentioned that the CCP will strengthen the construction of the internet to create “a clean network space.” As The Diplomat has been following, China’s internet controls has turned increasingly harsh since Xi came into office. Although the one paragraph related to the field of ideology and media seemed small compared to Xi’s 32,000-word work report, the short but sraightforward message, together with the CCP’s control on the internet in recent years, is already enough for Chinese journalists to expect more censorship in the following five years after the 19th Party Congress. China’s state media elevates Xi’s status to a level as high as Mao Zedong and Deng Xiaoping.